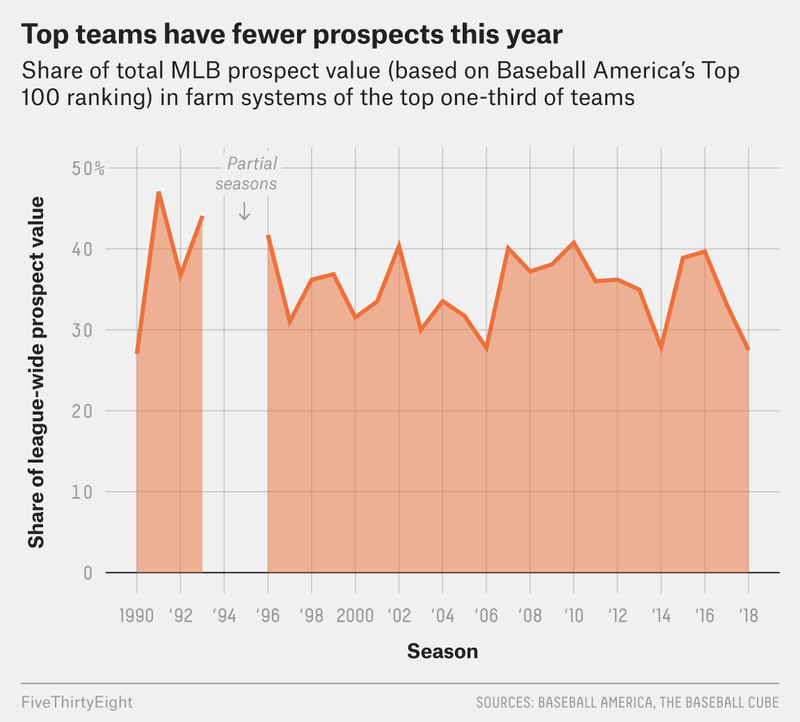 Baseball’s top teams should be buying — but do they have the prospects for it? A last-minute trade for Jacob deGrom would cost a bounty of prospects, which many of the big buyers don’t really have. Major League Baseball’s annual trade deadline — this year’s version of which falls at 4 p.m. Eastern on Tuesday — is an annual chance for teams to take stock of their short- and long-term future plans. As our research has shown in the past, World Series front-runners should generally be willing to give up quite a large bushel of future assets in exchange for talent that might bring them a ring in the here and now. Meanwhile, teams on the fringe of the playoffs should be relatively indifferent between playing for the future or the present, and bottom-feeders should frantically sell everything they can. Those guidelines become apparent when we run our “Doyle Number” statistic for this season’s teams. As a quick refresher, the Doyle Number1 represents how many future wins of talent a team should be willing to part with to acquire 1 extra win of rental talent over the remainder of this season (including the playoffs). So the Boston Red Sox, who have the highest Doyle Number in baseball, should be willing to trade away up to 2.2 wins of future talent in exchange for every 1 win of talent they acquire for this year’s stretch run — they’re clear deadline buyers. By contrast, teams with Doyle numbers around zero are obvious sellers — they have no reason to give up future talent to acquire extra wins this season. Finally, a Doyle of 1.0 means a team could swing either way between buying and selling. Expected wins are derived from the team’s current Elo rating. This year’s crop of buyers is unusually robust — three teams have Doyle Numbers north of 2.0 (most recent years have usually had only one or two) and six teams are at or above a Doyle of 1.8 (when the typical year has two or three in that range). At the same time, 12 teams have Doyle Numbers that round to 0.0, compared with an average of nine in the previous three years we’ve been calculating the metric. It’s all a consequence of this supremely stratified, tank-tastic MLB season. On the one hand, you might imagine that such a surplus of buyers and sellers would pave the way for more trades than usual, since a lot of teams have their motivations aligned for deal-making. And there have been some notable moves made thus far: Manny Machado to the Dodgers, Cole Hamels to the Cubs, Ian Kinsler to the Red Sox, Mike Moustakas to the Brewers, J.A. Happ to the Yankees and so forth. But the particulars of this year’s market could also play some tricks with what we think of as ordinary deadline business, when we consider who has how much of which asset — long-term vs. short, young talent vs. established stars. Elite teams can only swap with rebuilding ones if they have the right prospects to send away, and there’s evidence that many of the best youngsters have already flowed from the contenders to the tankers before anybody had a chance to do their deadline shopping. To see this, we can look at how many members of Baseball America’s Top 100 prospects are in the farm systems of top teams, as opposed to everybody else. For each full season since 1990,2 I gathered the list of top prospects and assigned each ranking slot its average future value, according to my research here. To focus on prospects that haven’t yet made a dent in the big leagues — i.e., the kind more likely to be thrown into deadline trades — I filtered out players who exhausted their rookie eligibility during the season in question (or, for this year, players who are on pace to do so). Finally, I calculated the percentage of leaguewide prospect value that belonged to teams in the top third of all MLB teams by projected end-of-season record (using our Elo ratings, as of July 30 each season). And this year, only 27.5 percent of prospect value is in the systems of top-tier teams, the lowest such mark in any full season since 1991. Although the share of prospects in the hands of top teams isn’t a perfect predictor of how many deadline deals will go down,3 it does speak broadly to the ability of contenders to act on the advice that their Doyle Number would recommend. In 2016, for instance, the Cubs’ surplus of top prospects — and urgency to win a World Series after a 108-year dry spell — led Chicago to trade a number of gifted farmhands (headlined by stellar 2018 rookie Gleyber Torres) to the Yankees for a few months’ rental of closer Aroldis Chapman. It wasn’t the first time that future talent was pawned off for an immediate payoff, and it was far from the last. Because of their low pay and endless promise, minor leaguers serve as the ultimate grease in the wheels of the trade-deadline machine. And they may yet help smooth along another blockbuster in the next few hours, perhaps one including Bryce Harper, Jacob deGrom, J.T. Realmuto or Chris Archer. But if the deadline does end up feeling a little slower than we’d expect from the buyer/seller profiles implied by this year’s standings, it could just be because most of the buyers have already bought and the sellers have already sold. Named after the infamous 1987 trade in which the Detroit Tigers sent future Hall of Famer John Smoltz, then a 20-year-old prospect, to the Atlanta Braves for 36-year-old Doyle Alexander. So, excluding partial seasons in 1994 and 1995. Since 2009, its correlation with the share of all trades that happened at the deadline was 0.36.